Tuberculosis (TB) of the breast is a rare disease despite the fact that TB affects one to two billion people worldwide.TB is a chronic granulomatous disease caused by Mycobacterium, predominantly Mycobacterium tuberculosis. In 1829, TB of the breast was first described by Sir Ashley Cooper as ‘scrofulous swellings in the bosom’ of young women suffering from enlargement of the cervical lymph nodes. TB remains a major problem in many parts of the world. It is more common in undeveloped countries but is re-emerging in the West. The globalisation of TB is related to the prevalence of human immunodeficiency virus (HIV)/acquired immunodeficiency syndrome (AIDS), the emergence of multi-medication-resistant strains of TB and the increased movement of people (travel and immigration). Until recently, most cases of TB of the breast have been reported in South Africa and India. However, even in endemic areas, TB of the breast has not been commonly reported. It has, in fact, been described as ‘rare’. From 2002 to 2008, 21 patients were identified that met the criteria for the study. The age range was from 27 to 74 years, with a mean age of 40 years. Ninety-five percent were female. All the cases except one had unilateral disease. The right breast was involved in 57% of the patients. Seventy-one percent complained of palpable axillary nodes. Fifty-two percent of the patients complained of diffuse breast swelling. Only one patient presented with a discharging sinus. Upon clinical examination, 80% had palpable axillary lymph nodes. Thirty-eight percent had a palpable breast mass, including the male patient who had a chest mass that extended to involve the breast. Ultrasound was performed in all the patients. Enlarged axillary lymph nodes and an oedematous breast were the most common findings on ultrasound. Eighty percent of the patients had enlarged axillary lymph nodes on ultrasound. The axillary lymph nodes that were positive for TB or ‘suspicious for TB’ varied in size in short axis diameter from 10 to 41 mm. Absence of the normal fatty hilum or cortical thickening was present. The shape of the nodes ranged from oval to round. Sixty-two percent of the patients had an oedematous breast on ultrasound. The ultrasound features of an oedematous breast include increased echogenicity of the parenchyma and dilated lymphatics. Skin thickening could be appreciated in these patients on ultrasound. The intramammary masses varied in appearance on ultrasound. Unilocular abscess formation was noted in three (14%) patients. Two (10%) patients had well-defined, smoothly marginated nodules that were hypoechoic to isoechoic on ultrasound. Both of these patients also had enlarged ipsilateral axillary lymph nodes. In these two patients, both the axilla and the breast were subject to FNA and both results were ‘suspicious for TB’. In the two patients (10%), multiple, complex intercommunicating collections were present in the breast. Patients above 35 years of age were selected for mammography and this was performed in 10 patients (48%). One 38-year-old patient was incorrectly not assessed mammographically. Forty percent of the mammograms had a diffuse increase in density in the affected breast when compared with the normal breast. A focal increase in density was seen in 40% of the mammograms. Coarsened trabecular markings were noted to be diffuse in 40% and focal in 20%. Forty percent of the mammograms revealed diffuse skin thickening. Seventy percent of the patients had enlarged axillary lymph nodes visible on mammography. An intramammary mass was present in 40% of the mammograms. All the patients in the study were subjected to ultrasound-guided FNA of the breast mass and/or an axillary lymph node. The male patient with the chest wall mass had a single-core biopsy in addition to the FNA. The number of passes for the FNA ranged from one to three per lesion. Fifteen patients underwent FNA of axillary lymph nodes. Of these 15 patients, nine were confirmed for TB (60%) and six (40%) were suspicious for TB. The seven intramammary FNA results showed five (71%) to be positive for TB and two (29%) to be suspicious for TB. The one chest wall mass was positive for acid fast bacilli. 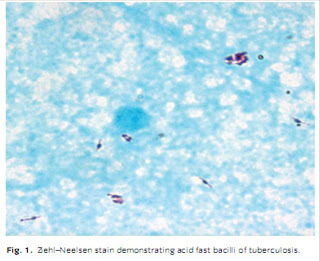 The results were obtained with TB BACTEC culture or Ziehl–Neelsen staining. 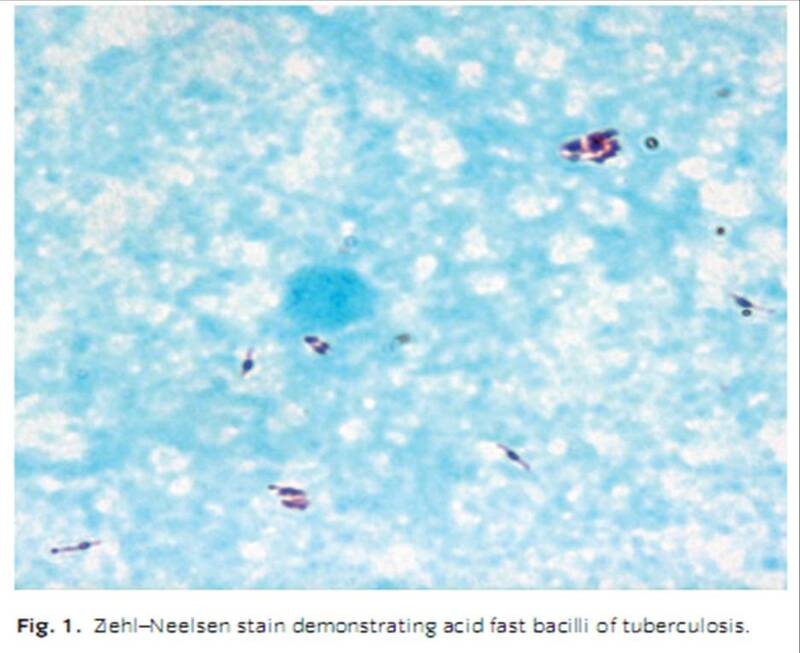 Thirteen were positive on TB BACTEC culture and two were positive on Ziehl–Nielsen staining only for acid fast bacilli. Three were positive on both BACTEC culture and Ziehl–Neelsen staining. Five were ‘morphologically highly suspicious for TB’. The mean number of days to diagnosis with BACTEC culture was 27 ± 12.5 days. TB accounts for less than 0.1% of all breast lesions in Western countries and approximately 4% of all breast lesions in TB endemic countries. Mammary tissue appears to provide a relatively infertile environment for the survival and multiplication of the TB bacilli. The relative lack of lymphoid tissue within the breast may be in part responsible for this. 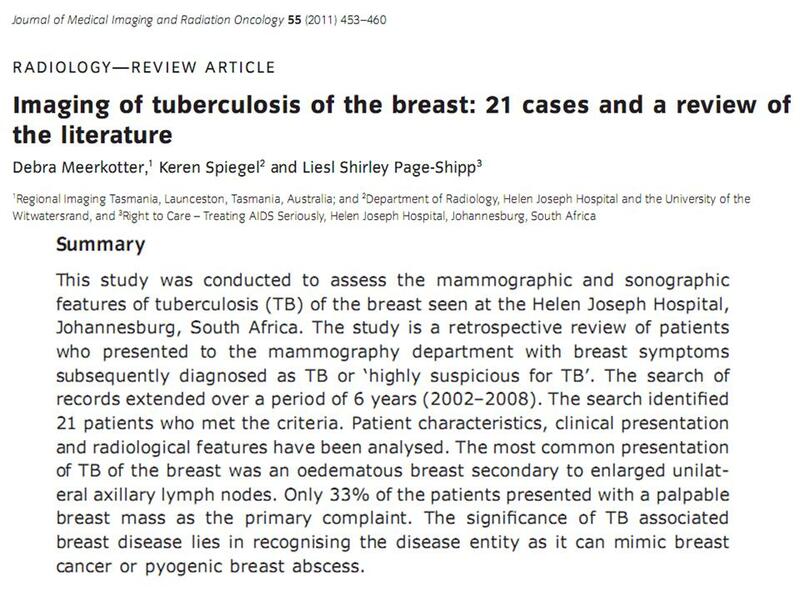 The significance of TB of the breast lies in recognising the disease entity as it can mimic breast cancer or pyogenic breast abscess. The disease is very rare in males (4% of cases), which was confirmed in our study where only one patient (5%) was male. Females tend to present in the reproductive years (20–40 years) of age. In our study, there was a mean age of 40 years. The frequent changes the breast undergoes in this period may make the breast more liable to trauma and infection. In pregnant and lactating females, the ducts are dilated and there is increased vascularity of the breast. The breast is also more predisposed to trauma and infection. The disease is reported to be bilateral in only 3% of cases. Similarly in our study, only one case (5%) was bilateral. Different series demonstrate predominance of the left breast or of the right breast. Fifty-seven percent of our series involved the right breast. The risk factors for TB of the breast appear to be related to AIDS, multiparity, lactation, previous suppurative mastitis and trauma. In the setting of our study, HIV is a major risk factor. A study at this hospital in 2006 found the level of concurrent TB and HIV co-infection to be 95%. The incidence of HIV in this series is not known and can only be inferred from the data of the 2006 study. Tuberculous mastitis (TBM) is classified as primary or secondary. Primary TBM is extremely uncommon and is confined only to the breast. Secondary TBM is seen when there is coexisting TB elsewhere in the body. However, an extramammary source is identified in less than 15% of cases. The routes of infection include the following: lymphatic, haematogenous, spread from contiguous structures, direct inoculation and ductal infection. Centripetal lymphatic spread is the most accepted view for spread of infection. Here, the spread of disease from the lungs to the breast can be traced via tracheobronchial, paratrachael, mediastinal and internal mammary nodes. According to Cooper's theory, communication between the axillary glands and the breast results in secondary involvement of the breast by retrograde lymphatic extension. In 50–75% of cases of TBM, axillary lymph node involvement was present, lending support to this hypothesis.Our series would support this view with the most common presentation being that of enlarged axillary lymph nodes in 71% of the patients ( Figs 2,3). Figure 2. Right mediolateral oblique mammogram. The axillary lymph nodes are infiltrated with TB. The skin is thickened and the breast is oedematous secondary to the axillary adenopathy. Figure 3. 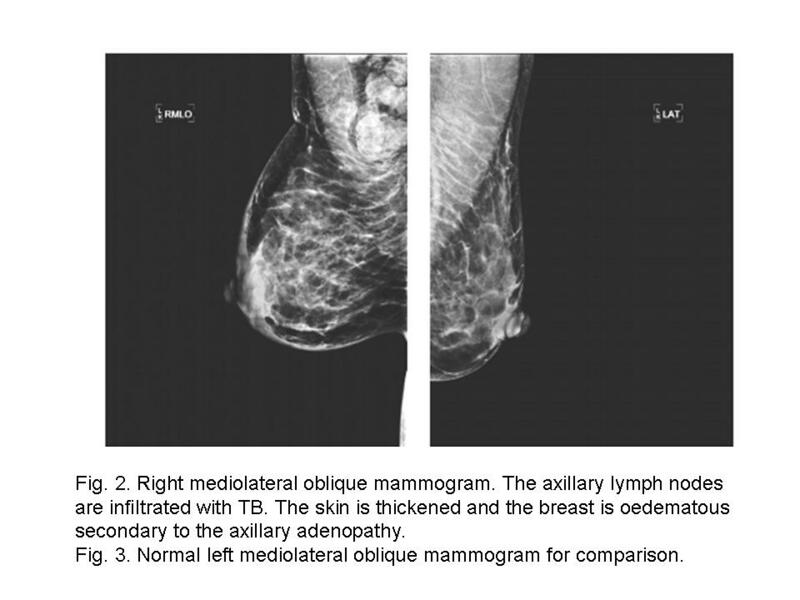 Normal left mediolateral oblique mammogram for comparison. Breast tissue appears to be resistant to haematogenous spread of TB. In an autopsy series of 34 patients who had died of miliary TB, TB was demonstrated in almost all organs except the breast. Direct extension of TB from contiguous structures such as infected rib, costochondral cartilage, sternum, shoulder joint, pleura or skin can occur occasionally. The one male patient in our series presented in this manner with extension of TB from the chest wall into the breast. TB of the faucial tonsils of suckling infants may spread to the lactiferous sinus of the breast resulting in primary TBM. This is not an important mode of spread in developed countries. Clinical presentation is commonly a painless lump, which is usually ill-defined and irregular. It may be a hard mass, clinically indistinguishable from a cancerous mass. The upper outer quadrant is the most common site. There may be oedema of the breast with extensive involvement of the axillary lymph nodes. Fistulous tracts and breast abscesses may occur. In our series, the incidence of fistulous tracts was only 5%. The nodular form is slow growing. If immunity is good and there is low virulence of the organism, the inflammatory process is limited to the formation of a non-caseating granuloma producing a well-defined, smoothly marginated nodule. Macrocalcification may be associated with this nodule. Thickening of the surrounding breast parenchyma and Cooper's ligaments is minimal. Ultrasound features of this type of TBM resemble a fibroadenoma in that they are well-defined hypoechoic masses with posterior acoustic enhancement (see Fig. 4). Figure 4. 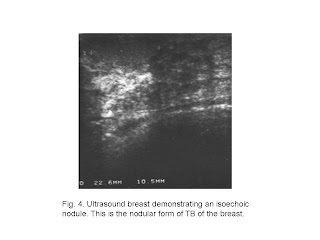 Ultrasound breast demonstrating an isoechoic nodule. 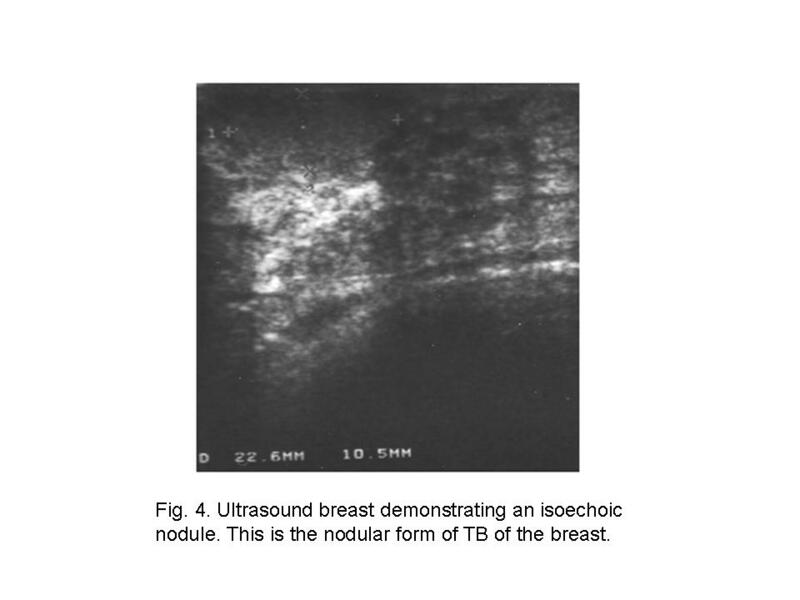 This is the nodular form of TB of the breast. If there is abscess formation, perilesional oedema or scarring, the nodule is irregular in outline mimicking a cancer. In our series, 14% of the patients presented with intramammary collections in keeping with unilocular abscess formation (see Figs 5,6). Figure 5. 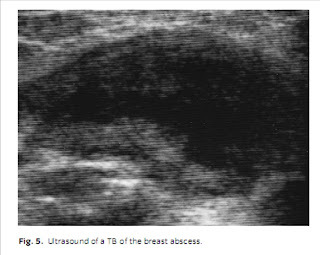 Ultrasound of a TB of the breast abscess. Figure 6. 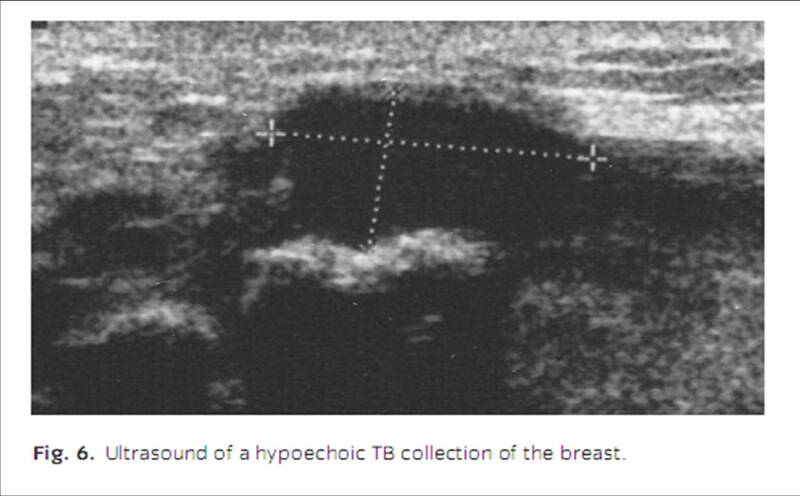 Ultrasound of a hypoechoic TB collection of the breast. In this study, five patients were classified as nodular TB of the breast. This is 24% of the patients studied. Two of the five patients presented with well-defined, smoothly marginated nodules within the breast, accounting for 10% of the study group. The remaining three (14% of the study) had unilocular abscess formation. The diffuse form is seen with more virulent infection and poor immune response. In this form, multiple foci of TB intercommunicate and develop into abscesses. Irregular margins with skin thickening are noted in the diffuse form. On mammography, the centre of the lesion is less dense than the periphery due to fluid breakdown centrally. The imaging findings may mimic an inflammatory cancer with skin thickening. On ultrasound, the abscess is characterised by a heterogeneous, hypoechoic mass with irregular margins and posterior acoustic enhancement. The presence of mobile internal echoes is highly suggestive of abscess formation. Two of our patients (10%) had multiple intercommunicating abscesses. These were seen as multiple complicated interconnecting collections with surrounding oedema, which was demonstrated both mammographically and with ultrasound. Fibrosis is the dominant feature of the sclerosing form. Mammographic features vary according to the degree of fibrosis present producing two main features on mammography. The breast becomes denser as fibrosis develops and is more localised to the involved quadrant. In addition, as the Cooper's ligaments become involved by the fibrotic process, there is retraction and atrophy of the breast. 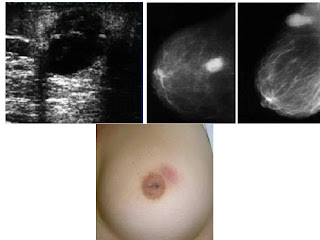 The atrophy of the breast is a distinguishing feature from malignancy. The reticular scarring and interlobular oedema may obscure an underlying mass mammographically and for this reason ultrasound is important to assess the breast further. No patients in this study were classified as sclerosing. Further imaging findings, not falling into the above classification, have been described. These include ductal involvement occurring secondary to direct inoculation of the organism into their ostia. Retroareolar linear densities are seen mammographically, and on ultrasound there are dilated debris filled ducts. Healed granuloma appears as calcifications on mammography. The calcifications are predominantly microcalcifications. 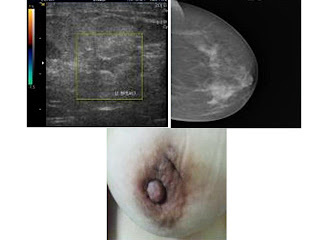 Skin changes may be evident mammographically. The skin may be oedematous and thickened. A sinus tract may be evident as a localised area of skin thickening and a bulge in the contour of the skin. Intramammary or extramammary lymph node enlargement may also be visible on imaging. In previous reports, the lymph nodes maintain benign features, i.e. are 1 cm long in the short axis, retain the sinus fat lucency and have oval shape. In contrast, our series reveals the lymph nodes to have a pathological appearance with loss of the normal fatty hilum and enlargement up to 41 mm in short axis. Ultrasound is sensitive in detecting and characterising axillary lymph nodes (see Fig. 7). Figure 7. 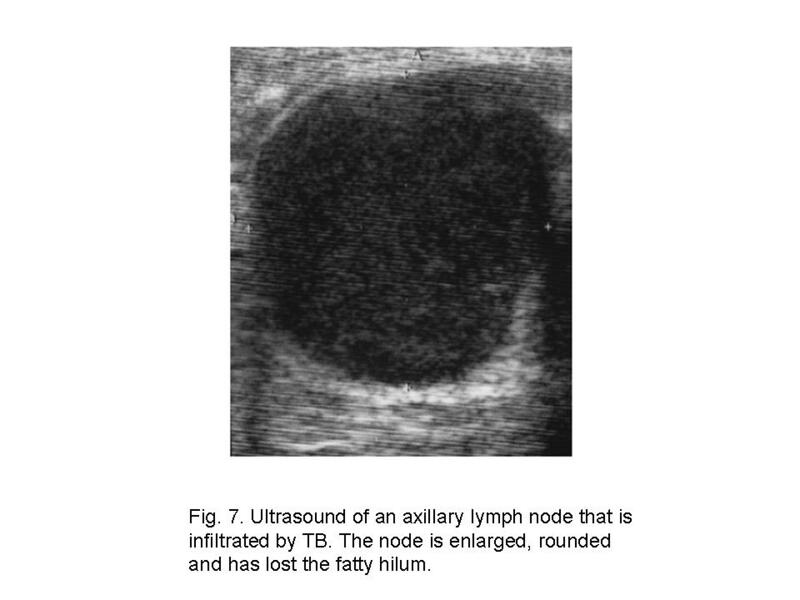 Ultrasound of an axillary lymph node that is infiltrated by TB. The node is enlarged, rounded and has lost the fatty hilum. In this study, the predominant presenting feature was that of enlarged axillary lymph nodes with associated skin thickening and diffused oedema of the breast. In this group, this is the most common presentation and distinguishes this study from other studies of TB of the breast (see Table 4). The role of ultrasound is that of a complimentary modality to the mammogram. In suspected TB of the breast, ultrasound should be performed. The value of ultrasound is in its ability to differentiate solid from cystic lesions, identifying nodules masked by the coarse stroma and assessing the lymph node status. Ultrasound is also the means for biopsy and percutaneous abscess drainage and may add information when excluding malignancy. A four-limb strategy of clinical assessment, mammography (patients in this study over the age of 35 years were selected for mammography), ultrasound and FNA is required to make the diagnosis. Imaging with MRI has not been extensively used in TBM. A breast abscess will demonstrate a ring-like bright signal intensity on T2-weighted images. In post-gadolinium, there is a non-specific enhancement seen in abscesses and cancers. The value of MRI is in determining the extramammary extent of the disease. Treatment of TB associated breast disease at this institute follows the 2009 South African National TB guidelines. The recommendation is the same regimen for extra-pulmonary TB (TB of the breast) as for pulmonary TB. The standard treatment regimen for patients who have never had TB is a 2-month intensive phase with four medications (isoniazid, rifampicin, pyrazinamide and ethambutol), which results in rapid killing of bacilli. The subsequent 4-month continuation phase with two medications (isoniazid and rifampicin) eliminates the remaining bacilli. Patients who received previous TB treatment for at least 4 weeks have a higher risk of medication resistance and receive an extended regimen. The intensive phase lasts 3 months with the addition of a fifth medication, the injectable streptomycin to the standard four medications for the first 2 months. The continuation phase with three medications (isoniazid, rifampicin and ethambutol) lasts 5 months. In summary, TB patients receive fixed dose combinations of between two and five medications for 6–8 months depending on the stage of therapy and whether they have previously been treated for TB. 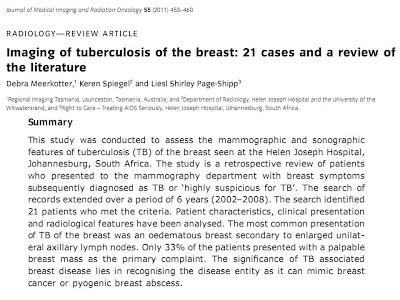 TB of the breast is an uncommon disease even in endemic countries; however, it should be considered in the differential diagnosis of breast pathology as it may mimic inflammatory breast cancer and pyogenic abscess. The most common presentation in this series is that of a swollen oedematous breast secondary to enlarged axillary lymph nodes. FNA of the enlarged axillary lymph nodes and/or breast mass with confirmation of TB on Ziehl–Neelsen staining or BACTEC culture is required for the diagnosis of this uncommon disease. 1/ Chẩn đoán dựa vào siêu âm trước tiên (90%, do đó là chủ yếu), nhũ ảnh, sinh thiết (phần lớn lao vú chỉ được chẩn đoán chính xác bằng mô học với các tổn thương mô hạt (granulomatous), hoại tử bã đậu (caseum), đại bào Langhans) và nhuộm trực khuẩn kháng acid bằng phương pháp Ziehl-Neelsen (tỉ lệ dương tính thường thấp). Các phương tiện hình ảnh học khác ngoài siêu âm chỉ giúp xác định bệnh lan rộng, có tính cách định hướng và phân biệt (hơn là để chẩn đóan). Tuy nhiên nhũ ảnh khó phân biệt giữa ác tính và lao vú. 2/ Thường gặp nhất là thể lan toả. Thể xơ teo (sclerosing) và carcinoma kết hợp với lao vú chưa gặp bao giờ. 3/ Với siêu âm đàn hồi Shear Wave Elastography: Dùng elastography để bổ sung chẩn đoán phân biệt trong tạo hình siêu âm về lao vú (và ung thư vú). Khối lao vú có đặc điểm rất cứng ở viền ngoại biên, độ đàn hồi E= >120kPa (đỏ), vùng trung tâm mềm, không đồng nhất, có vùng có độ đàn hồi E= 60kPa (xanh hoặc không có tín hiệu). Còn trong ung thư mô mềm có vùng hoại tử thì ngược lại: bản đồ màu thiên về màu đỏ (cứng) và dàn đều từ ngoài vào trong. Đặc điểm elastogram trên giúp chọn vị trí sinh thiết, nên chọn những vị trí màu đỏ (cứng), vì nếu sinh thiết nhầm vào chỗ màu xanh (mềm) hoặc mất tín hiệu (vì hoại tử) thì sẽ có kết quả âm tính giả.